Although designated a YA novel, this re-creation of the circumstances of the Clutter Family murders is more than a rehash of Truman Capote’s In Cold Blood from a teen perspective. It is a meticulous dissection of small town life in the aftermath of an unexpected and unspeakable tragedy. Holcomb, Kansas, is a tiny, sleepy town in 1959. A farming community in the western part of Kansas, nothing much happens in Holcomb. That things “like this” can happen in a town like Holcomb, Kansas, is inexplicable to its residents. Unlike what one might expect, Holcomb’s citizens don’t blame some stranger, some vagrant, who happens on River Valley Farm and decides to murder the Clutters. Outsider Carly Fleming, a recent transplant from New York City, is convinced that Bobby is innocent. She can’t understand why even her boyfriend, Seth, who is supposedly Bobby’s best friend, seems willing to fall in with the town’s unspoken opinion that Bobby is guilty. Carly’s status as an outsider allows her to identify with Bobby’s sudden fall from grace. Now that Bobby is being slowly ejected from the protective environment of Holcomb, he becomes an outsider, too. Although she visits the Clutter home several times a week, she is not Nancy’s best friend, just her secret math tutor. Bobby Rupp is taken into custody, his school locker searched, as well as his home. Nothing suspicious is found—as Carly knows there won’t be. Carly, too, is called into to answer questions by Agent Dewey of the Kansas Bureau of Investigation. A note in Nancy’s handwriting mentioning Carly’s name has been found. It is a reminder for Nancy to remember to take her red velvet dress to church for Carly. Instead of Carly’s wearing the dress to the Sadie Hawkins’ Day Dance, Nancy is buried in it. Now that she is drawn into the investigation Carly on a mission now: to prove Bobby innocent of the Clutter murders. But Carly’s mission is more than proving his innocence; it is restoring his place in the community and carving out a place of her own. Carly finds herself under scrutiny by the police chief time after time. She enters the blood-splattered Clutter farmhouse despite the fact the house is off limits. She takes a lie detector test. Her actions have made her a target of suspicion not only of Agent Dewey, but by the “popular girls” at Holcomb High school. Carly is obsessed by the case, by the Clutters, and particularly by Nancy. She sneaks into county law enforcement offices after hours to read files. She finds mention of two suspicious strangers, and brazenly interviews the mother of one of them: Richard Hickock. When Richard Hickock and his cohort, Perry Smith, are arrested for the murder of the Clutter family, Carly expects that Bobby and she are exonerated. Her expectations are not met. “Not everyone in town thinks we got the right men. Some think that there might be others involved . . . It has to be someone local,” says mean girl Karen. The town still is mired in suspicion, still distrusting their neighbors. Then the town has something else—or someone else—on whom to focus their unresolved anxiety when Carly’s worst nightmare occurs. The Fleming family left New York City because Carly’s father was the court-appointed defense attorney for a murderer who was acquitted. The resulting negative publicity drove the family to Holcomb. It is happening all over again: Carly’s father is appointed defense attorney for Perry Smith. Now to Carly’s peers she is a traitor. Her father is defending a vicious murderer; he will try to win an acquittal for a guilty man, let a killer go free. Truman Capote, an odd little figure to the folks in Holcomb, dressed in outlandish clothes, and accompanied by his friend, Harper Lee, is interviewing everyone who knew the Clutters; rather, it is Harper Lee who is doing most of the interviewing. Holcomb doesn’t quite know what to think of Capote, but Carly does. He’s made up his mind about Holcomb, about the murders, and it doesn’t matter what the people who actually knew the Clutters said about them. The Clutters and all Holcomb are now set in concrete. Another icon of the sixties who doesn’t really figure into the story except to emphasize how out of place Carly’s mother is, and by extension, the whole Fleming family, is John F. Kennedy, an old friend of Carly’s mom. 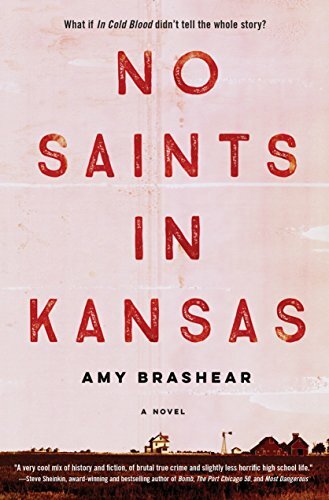 No Saints in Kansas by Amy Brashear, although fictional, paints a picture of a town at odds with itself. As one who grew up just a few miles from Holcomb, Ms. Brashear brings a perspective of small town life missing from In Cold Blood. Highly recommended.